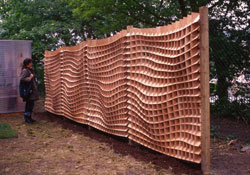 London-based designers Superblue were inspired by the organic forms of hedgerows to create a 'soft' boundary structure--an undulating honeycomb, which they have turned into fence panels, and a potting shed, both in wood, as well as an an aluminum gate for a private sculpture park. 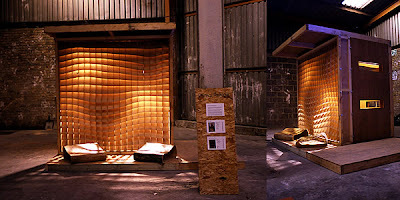 The varying intervals between the cross-pieces within the panels create striking patterns when lit. 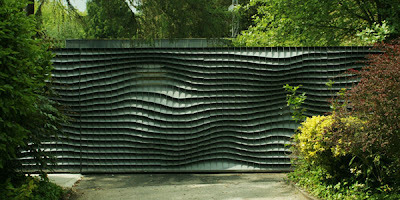 It's not easy to update what is essentially a trellis-fence...well-done. I love these -- they remind me of reflections in water of trelliswork or fences. Very interesting trellis. I like to copper color. These are soooo wonderful! Thanks for posting these. I'm glad I stumbled across your blog!